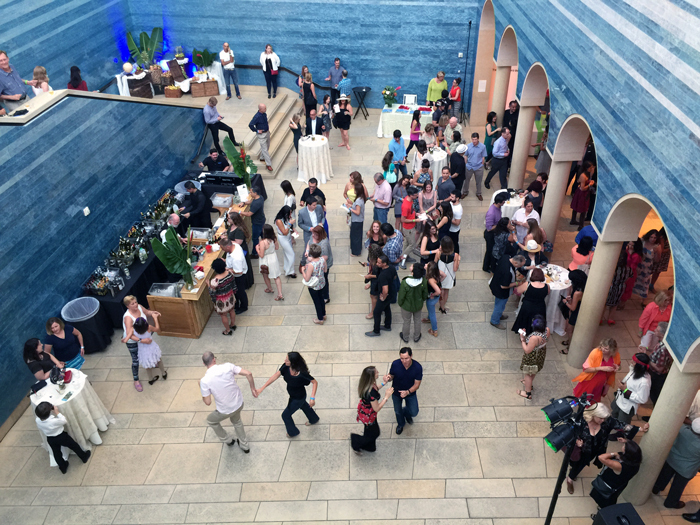 Blanton Museum of Art’s quarterly event, B Scene, offers open art galleries, crafts, food, drinks, dancing and live music. 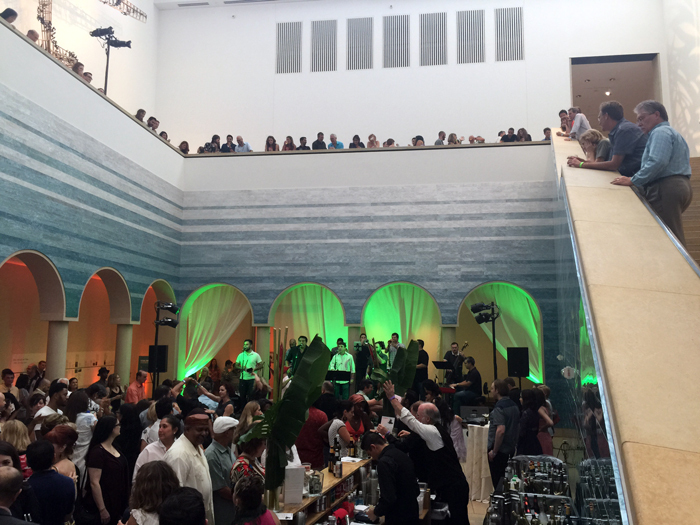 At this unique party, visitors get an exclusive experience of The University of Texas at Austin’s beautiful art museum. UT’s art collection once resided in the Harry Ransom Center and the art building, but the impressive art selections needed their own home. In 2006, Blanton Museum of Art opened its doors at E. Martin Luther King Jr. Boulevard and Congress Avenue. In order to introduce the new building and expanding collection to the public, several programs were implemented. This marked the beginning of B Scene, with Blanton taking a cue from other major museums that hold nighttime celebrations to attract new visitors. Naturally, Blanton’s event has taken on uniquely Austin traits by showcasing local musicians and food vendors. B Scene was originally intended to occur monthly, but the large scale of the event is better suited to its now quarterly schedule. 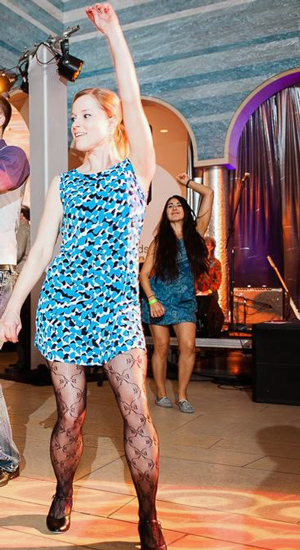 Each party has many entertaining artistic elements, with a theme inspired by the current exhibit on the ground floor. Perhaps the biggest B Scene ever was “Birth of the Cool,” which exceeded 1,500 guests and highlighted an exhibition of mid-century Californian art, design and culture. Typically, attendance runs between 600-1,200 people, depending on the popularity of the theme. Latin American themes tend to bring in more people, as do saucier themes like Desire, which coincided with Valentine’s Day. Each B Scene celebrates Austin music, by featuring local performers like the dynamic Octopus Project. The Blue Hawaii B Scene even featured Dale Watson’s Elvis alter-ego, Dalevis, performing hip-moving Elvis songs. 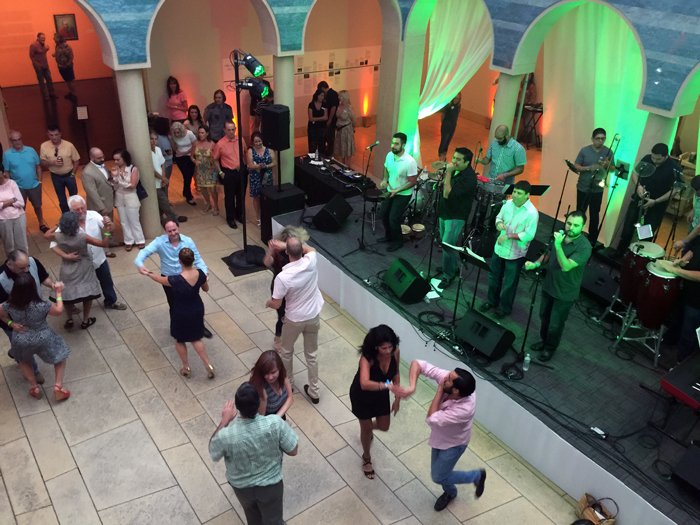 A lively dance floor often accompanies the live music. This is where people of all ages can be seen in costume. Anyone who feels inspired by the theme is encouraged to dress up and break out their neglected eclectic clothes. If you need encouragement to get out there and let loose, members of the Go Dance team can guide you. They’ve instructed party-goers to “jerk” and “do the monkey” at pop-art themed exhibitions, and led swing dancing during the Blue Hawaii B Scene. 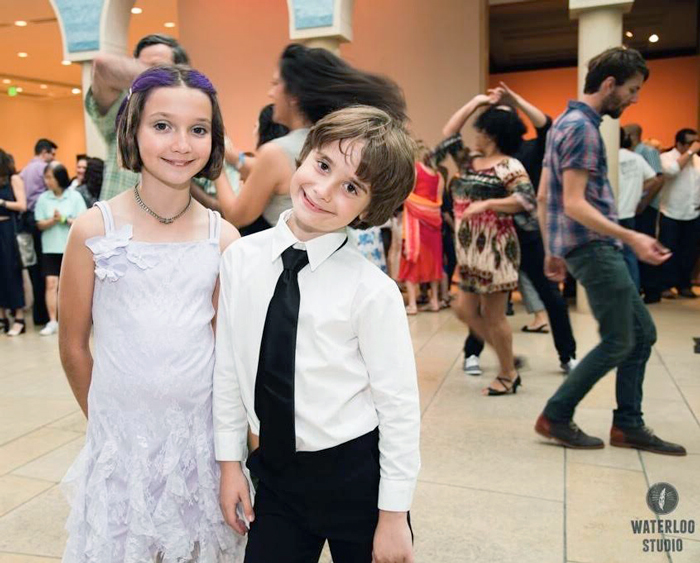 If dancing isn’t your style, themed crafting booths are set up for miniature art projects. Past events have included henna, trading card- and postcard-making, and even personality quizzes and scavenger hunts. Photobooths are often available nearby to provide additional souvenirs of the memories you’re making. 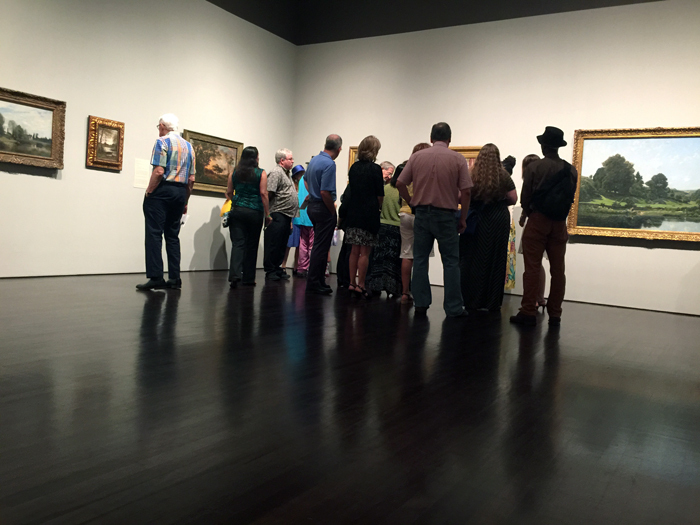 Many people return to see Blanton and new exhibitions after visiting during B Scene. 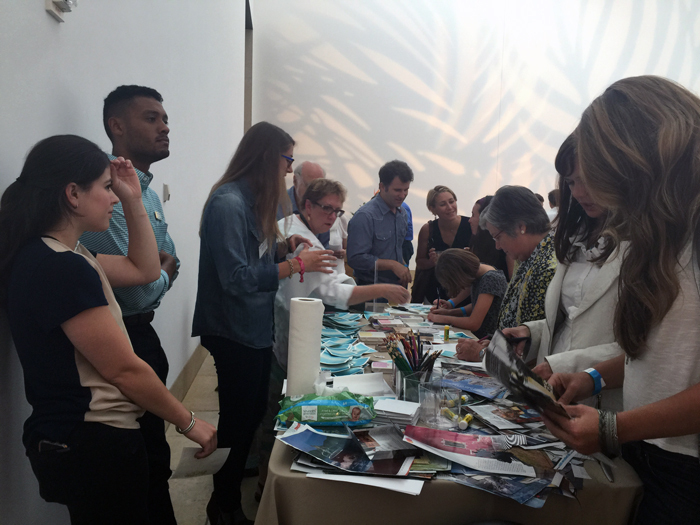 The event opens up the art for conversation, and encourages repeat visits for quieter reflection. The next B Scene is March 11, 2016 and is titled “Come As You Are.” An exhibition of art from the 1990s will be on display, which you can check out while listening to DJ Dylz Pillz and ’90s covers from Zoo Dust. If you want to attend the next B Scene, follow Blanton Museum of Art on Facebook, Twitter and Instagram for updates and check out their website. Tickets are $12 and are available in advance or at the door. Members of Blanton get into B Scene for free and have access to a line-free check-in and members lounge. Become a member here. What would you wear to the upcoming ’90s-themed B Scene?